Welcome to the website of David Stanhope! Thanks are due to Paul Marshall, photographer, and Timothy Lumsdaine, designer, for their excellent work in creating the CD cover for Dracula. Christo Curtis has made a draft master of the entire double CD which awaits approval from the relevant parties! So we appear to be on track for a May release. The launch will probably be held at the Opera Centre in Sydney. Practice continues on the opus 25 Chopin studies and the Godowsky versions. I can play some of them! I must mention my recent trip to Adelaide to attend the celebration of Bob Hower's life. Bob was a friend and champion of my concert band music (see CD page). I was able to say a few words of appreciation at the event. Bob was one of the finest musicians I have known. David Stanhope is a free-lance conductor with wide experience in orchestral, opera, chamber and film music. He is a composer, especially for wind band, with many publications. 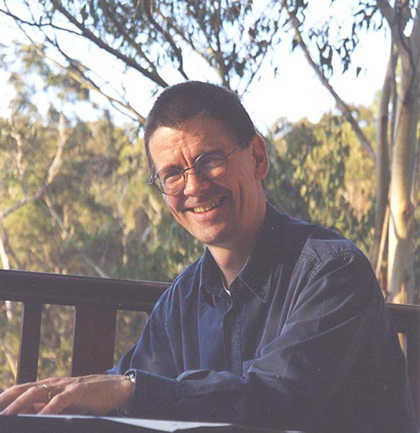 As an instrumentalist, David Stanhope was a french horn player for many years before switching to bass trombone; he is also a virtuoso pianist. Just replace the AT with @, and the DOT with .